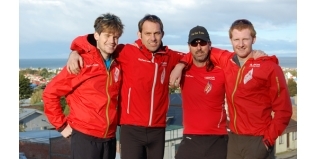 Expedition spanning 7 x 50km Ultra Marathons on all 7 continents in 7 consecutive days sees Stuart Kershaw taken to hospital with exhaustion in Hong Kong but Oliver Dudley of London and Jack Jones from the North West successfully completed the fifth leg. Oliver Dudley and Jack Jones have successfully completed the 4th and 5th legs of the world's first ‘777 Ultra Marathon Challenge’ expedition today in Hong Kong along with accompanying American runner Chris Cuddihy. Unfortunately fellow Brit Stuart Kershaw was unable to complete the 5th leg being dropping out at 25km point and was taken to hospital with exhaustion and dehydration. Stuart is recovering nicely and should make the flight to South Africa to support the rest of the team this evening. Beginning on Saturday 14th of March at 2pm GMT the team tackled the Antarctic run first before flying back to Chile and running through the night in order to get to LA for Monday's third leg and then on to Sydney yesterday and Hong Kong today. On today's event Oliver Dudley, who is running in order to raise money the children's charity Kid's Company’ (www.kidsco.org.uk) comments "I am devastated for Stuart but relieved he is likely to be able to continue and support us through to the finish. For the remaining of us the chronic pain that is enveloping our bodies can only be outweighed by our mental strength, and this is what we will need for the final few marathons. I am looking forward to the finish on Saturday in London and a hot bath." The 777 Challenge will sees the athletes attempt to complete 7 x 50km Ultra Marathons on all 7 continents in 7 consecutive days in order to set a new world record, circling the globe one marathon at a time. The team members, who hold seven Guinness World Record's between them in Ocean Rowing, are participating in order to raise awareness and £200,000 for their chosen charities – ‘Kid’s Company’ (www.kidsco.org.uk), ‘Isaacs House’ (www.isaacshouse.org), and Hoylake Cottage (www.hoylakecottage.co.uk) . In the space of the 7 days, the team will run 350km (219 miles) and fly 50,000 miles, suffering the effects of changing time zones, body clocks and expected sleep deprivation in economy class. The 777 challenge will be a carbon neutral expedition thanks to supporting partner Windpower Wales (www.windpower-wales.com) who are offsetting all of the carbon dioxide from the flights that the team will make during the course of the week. The team are proudly supported by Nokia (sportstracker.nokia.com), Salomon (www.salomonsports.com/uk), Forgoodness Shakes (www.forgoodnessshakes.com), InterContinental London Park Lane (www.london.intercontinental.com) and Adidas Eyewear (www.adidas.com/eyewear). To follow the expedition visit www.7in7on7.com where blog updates, GPS tracking via Nokia Sports Tracker, Facebook, Twitter, Flicker, Images and Video links can be found.